MIDI stands for Musical Instrumental Digital Interface. It is a standard protocol that is used for the communication between electronic instruments and computers. MIDI provides control over individual tones, sequences of tones, the sound of instruments, polyphony, volume and many other things which are essential for the perception of music. The CindyScript MIDI interface offers a streamlined set of statements for creating music and sound effects easily and flexibly. Before we dive into the details of these statements we will give a brief overview of the architecture and the capability of MIDI. This will make it easier to understand its interaction with Cinderella. Whenever easily possible we also mention how the MIDI statements are accessible in CindyScript. Roughly speaking the most fundamental functionality of MIDI is to send information to a music synthesizer and tell it to play a note. In its most simple form this piece of information just consists of a number between 0 and 127 that tells the synthesizer what note has to be played. In standard midi coding the number 60 represents the note C in the middle octave. Increasing or decreasing this number by one corresponds to a half-step. Thus 61 corresponds to C#, 60 to D and so forth. The corresponding CindyScript statement for playing a tone of a certain pitch is playtone. Try for example playtone(60). However, a note comprises far more than a certain pitch. It has an associated instrument by which it is played, a volume, a certain location in space and many other characteristics. Some of them are more of a static nature (like the instrument) and do not change from tone to tone. Others like the volume are more dynamic in nature and change frequently within the a piece of music. MIDI lets you control all these parameters in a way that is close to the characteristics of music. Imagine the playing of a piano. The main characteristics that changes the volume of a sound that is generated by hitting a key is the velocity with which the key is hit. With this velocity not only the volume changes but also the complete sound characteristics of the tone. MIDI does not only model the volume but also (and completely automatically) this change of sound characteristics. For this reason the parameter that controls the volume is called velocity rather than volume. In Cinderella this parameter is controlled by a modifier that ranges from 0.0 to 1.0 So with playtone(60,velocity->0.5) you get a C with a medium volume. plays a C-major chord whose two lowest tones are played by the piano and whose upper notes are played by a vibraphone and a guitar. Each channel can be used completely polyphonically. So it is no problem that the piano play two notes at the same time. There are various other characteristics (reverb, balance, pressure, etc. ) of tones that can be accessed by modifiers. For a complete description we refer to the explanations for the various statements. We here only mention the most important one: duration. This parameter controls the time (in seconds) after which a note is released again. So playtone(60,duration->0.1,velocity->1) generates a short and loud C. The default for duration without explicit modifier is 1 second. So far we have only dealt with tones that are played all at once. There are two ways for creating melodies in Cinderella. Either one creates the timing explicitly by using the wait(...) command of CindyScript or one uses the built-in MIDI sequencer. We first briefly describe how the method that does not rely on the sequencer works. For this we only have to separate individual notes by wait statements. Generating notes this way has its disadvantages. First, the timing has to be described in detail by the CindyScript code. Second, during the wait(...) statements the execution of other CindyScript code is blocked, since CindyScript is waiting. For this reason (and several others) it is often by far more easier to use the built-in MIDI sequencer. plays a very simple version of "Oh, when the saints". Again the statement may be decorated by various modifiers. So here the instrument is chosen to be something that sound roughly like a trumpet (real trumpet players please forgive us). The speed is set to 300 beats per minute. A beat is the fundamental time unit for the sequencer. It is usually associated to a quarter note and there are usually four beats per measure or three beets per measure (if you have a valse). Also fractions of beats are allowed. They may be used to represent eight notes, triplets and so forth. The Syntherella interface to the sequencer is capable of expressing lots of musical content on a rather high level. Details are explained later on. Cinderella uses the predefined setup called General MIDI which is a specific collection of synthesized instruments. There is one convention that is special (though very useful) in General Midi. Channel 10 plays a special role. It is reserved for percussion instruments and can be used to implement a drum set. So whenever you use channel 10 you must be aware that this cannel has a special meaning. The MIDI numbers that usually represent notes in this case are associated to specific percussion instruments (not all 128 keys are used here). The following table gives you an overview of the instruments associated to the keys. By this it is relatively easy to create a rhythm track that accompanies your music. The percussion instruments are also very useful to create sound effects in other Cinderella applications. For instance if you use CindyLab to create a Ping-Pong game, you can use the Wood Blocks (key 76 and 77) to create click effects when hitting the ball. The following code shows a simple implementation of a Rock rhythm by using the sequencer. Observe that this program also uses the "goto" statement in playmelody(...) to rewind the track to the beginning. In the above code snippet several percussion instruments are overlaid in the same "melody" and form a complex rhythmic pattern. The note -1 is used as a pause. We will end our little introductory journey by creating a small piece of music consisting of a melody part and a drum pattern. MIDI can accept many different tracks for the sequencer. Each track may be associated with one player of a band. CindyScript offers a statement midiaddtrack(...) that silently adds a track to the sequencer without immediately playing it. All added track can be played by invoking the midistart() command. The following piece of code shows how our Rock rhythm can be combined with the "Oh, when the saints" melody to give a rocky version of this traditional piece of music. There are some specialties that will be explained in a moment. So in principle we add two tracks to the sequencer (one for the melody and one for the rhythm) and play it by using midistart(). There are some minor problems concerning timing and positioning that can be addressed using modifiers. First of all we take the "Oh, when the saints" track from the previous example as it is. We associate it with track 1 of the sequencer. Adding the Rock rhythm pattern from the other example to track 2 brings up several problems. First of all the timing does not fit. The beats in the melody are twice as long as the beats in the rhythm track. We can adjust this by using the modifier stretch->1/2 equivalently we could have halved the position numbers of the rhythm track. Second "Oh, when the saints" has some pickup notes (the first three). So the rhythm track should not start immediately. We can fix this by using offset->3. Finally, we need all together eight repetitions of the rhythm pattern. We do so by saying repeat->8. We first start with those statements that are used to generate single tones. Some of the tone characteristics can be addressed via modifiers. Description: This is the simplest way to create a tone. It creates a tone that is played immediately when this statement is invoked. Without modifiers the current default channel with its associated instrument is used. The default duration is 1 second. The default velocity is 0.5. Example: The following code plays a broken C-major chord. Modifiers: The command has several modifiers, most of them are self-explanatory. By the bend modifier the pitch of the note can be altered by two half-steps up or down. One unit of bend corresponds to one half-step. If duration is set to 0 (or smaller) then the tone is kept for an indefinite time and will be only stopped by the stoptone(...) statement. Description: Immediately stops the tone of the specified key. This might be useful if a tone has been started with indefinite length. Description: This statement is very similar to playtone. However in this case the frequency (in Hz) is explicitly given by a real parameter. Sometimes it may be useful to use the more physical oriented function playsin(...) instead. Example: playfrequency(440) plays a tone of 440 Hz with the currently chosen channel and instrument. The playfrequency statement is particularly interesting for simulating scales of non-european cultures, needed for instance in Indian Ragas or Javanesian Gamelan music. Modifiers: The modifiers are identical to playtone(...). However the bend modifier has no effect here. The Cinderella MIDI interface provides a rich set of instructions for handling the playing of sequenced music notes. In principle each note (or more generally each MIDI event) is associated to a certain timestamp that tells the sequencer when this note has to be played. Notes to be played are added as the elements of a CindyScript list. Each note is itself a small list consisting of the integer or a string representing the note to be played and its duration. Also control events like change of an instrument, or a change in volume are elements of this melody list. They are as well associated to a timestamp. Since all melody processing CindyScript functions refer to the same description of melodies by lists of events we explain this melody description language first. The second number in the short list describing a single note is its duration. The lengths of the durations are measured in beats. By default if the melody is played it play with a speed of 60 beats per minute. If necessary, this can be changed by a modifier of be the midispeed(...) command. still for each tone of the scale a full beat is used. However the notes are repeated by subdividing each beat. We will now describe the different elements of the melody description language. Tones and Chords: We have already seen that tones can be encoded as well as integers or as string names. So playing a single note has the format [<key>,<duration>], where <key> indicates the note (given as integer or string) and <duration> its duration by a positive real number. The following table describes how names are associated to the tones of the middle octave. Tones of the lower octave can be further lowered by an octave by appending a prime. So for instance C'' corresponds to the MIDI note 24. Similarly tones of the higher octave can be raised by an octave by appending a prime. So c''' corresponds to 96. It is also possible to play chords instead of notes. For this the keys of the notes in a chord have to be collected have to be collected in a list. SO the format of a chord is [[<key1>,<key2>,<key3>,...],<duration>]. The following example shows a melody list that play chords of increasing complexity. Finally, one can use the number -1 or the strings "P" or "p" as a pause. ["velocity",<real>]: set the volume. <real> is between 0.0 and 1.0. ["goto",<real>]: set the pointer to the position <real> measured from the beginning of the melody. Negative absolute positions are forbidden. ["gorel",<real>]: set the pointer to the position calculated relatively by an ofset of <real> to the actual position. The <real> may be negative. However moves resulting in negative absolute positions are forbidden. The following piece of code adds a (more quiet) second voice by using the goto(...)statement. ["||:"]: Beginning of a da capo. [":||"]: End of a da capo. Using these commands it is easily possible to transfer sheet notes with repetitions directly. The following line from "Oh, Susanna"
["channel",<int>]: changes the channel (0...15) that is currently used for the melody. ["instrument",<int>]: changes the instrument (1...128) that is associated to the channel. [<int>,<int>,<int>,<int>]: This statement (consisting simply of four integer numbers, gives access to other midi controls of instruments (consult a MIDI manual for details). The first number codes the controller, the second the channel to which it applies, the last two are data bytes. When a track is restarted the instruments are reset to their original values. The MIDI control language we described above now forms the basis of all other MIDI functions. Description: We have already used playmelody(...) in all previous examples on the melody language. It is the most direct was to play a melody that starts immediately. The list is assumed to be a melody described in the melody language. Invoking playmelody(...) adds the list to the sequencer and immediately plays it. It is important to know that when the melody is called all other tracks are erased from the sequencer. Modifiers: In addition, the statement has modifiers for globally setting the channel, instrument, speed, etc. The modifier loop tells the sequencer to rewind and restart after the melody is ended. The number in this modifier specifies how often a rewind is done. So loop->3 has the effect that the melody is played four times. Setting loop->-1 is interpreted as loop indefinitely. If this was called then the melody has to be stopped by adding a new (perhaps empty) melody: playmelody(). Alternatively the midistop() command can be used. Description: In contrast to playmelody(...) this statement adds a melody to the sequencer, but does not immediately play it. By this it is possible to build a more complex composition first by adding several voices and start playing it later when the composition is completed. Starting the sequencer is done via the midistart() command. If a track is added while the sequencer is already running the sequencer is not restarted. Silently the track is replaced by the new track. By this it is possible to build scenarios in which the melodies that are played change dependent on certain algorithmic processes. Furthermore the command has several modifiers that allow for altering the timing of the added track relative to the timing of the sequencer. Thus melodies can be stretched, shrinked or shifted. Details are explained below. offset <real> an offset that shifts the added piece of melody relative to the sequencer. A few modifiers need a bit of further explanation. Cinderella allows for a total of 16 tracks named 0 to 15. Each track resembles an individual independent voice. The track to which a melody is added can be selected by the track modifier. When you add a track the mode modifier specifies whether the current track is replaced by the new track, whether it is appended (to the end) of the already existing track or added (with overlay of timestamps) to the existing track. The timing of the new melody can be adjusted with respect to the already existing track in the sequencer. By the stretch modifier a number can be given that serves as a factor of all beat specification in the melody. Setting stretch->0.5 play the track with twice its original speed. Similarly offset can specify the position at which the new track is added. Setting offset->8 indicates that the track starts after the first eight beats of the sequencer. Finally, repeat specifies how often the track is added consecutively. Using stretch, offset and repeat can be very helpful when adding a drum pattern to an existing melody. Description: This command starts the MIDI sequencer. Tracks must have been added in advance by the midiaddtrack(...) command. Modifiers: Modifiers are similar to those of the playmelody(...) command. The following modifiers are allowed. Description: This command immediately stops the MIDI sequencer. Description: By this command the playing speed of the sequencer can be changed. The speed is given by a real number that resembles the beats-per-minute. By default the speed is set to 60, which corresponds to one beat per second (this is by far to slow for most music pieces). The speed value can also be altered, if the sequencer is already running. By this it is possible to (for instance) associated the speed with the position of a point that controls the speed. Description: This statement returns the current speed of the sequencer. Description: By this command the position of the sequencer can be set to a specific position. By this a CindyScript program can explicitly control for instance the entry point of a composition that is played. Description: This command returns the actual position of the sequencer. When the sequencer is running this value changes continuously. With the following CindyScript statements you can select the default instruments, associate them to channels, and influence their sound characteristics. Description: With this command you can associate an instrument to a channel. If no channel is specified the default channel is used. Each instrument is identified by an integer in the range 1...128. The correlation between instruments and the integers is explained in the next section on instrumentnames(). If an explicit channel is specified by a modifier the instrument of the corresponding channel is altered. Modifiers: This function supports various modifiers that influence the tone characteristics of the instrument. Here the modifiers velocity and duration influence the default velocity (volume) and duration with which a tone is played (for instance by playtone(...)). Description: This statement return a list of all instrument names available on your computer. In the General MIDI database (that is probably preinstalled on your machine) you have the following instruments at hand. Description: This command selects the current default channel that is used for playing tones with playmelody(...) or playtone(...). Via modifers it is possible to change the instruments and tone characteristics of the selected channel. Modifiers: The modifiers here are very similar to the instrument modifiers. Description: By this statement the overall volume of the MIDI sound of a channel is controlled. The parameter is a real number in the range 0.0...1.0. Usually this statement affect the volume of the default channel. However, by modifiers one can select the affected channel. channel 0 ..15 or "all" the selected channel. The channel number is either explicitly specified or by using "all" all channels can be affected. Description: By this a specific MIDI controller of a channel can be set. The first parameter specifies the number of the controller (0..127), the second parameter (0..127) specifies the data set to the controller. Controllers may affect characteristics like reverb, balance, and other characteristics specific to the instruments. The data values are taken in the range 0..127. For more details see a manual on General MIDI. Modifiers: Modifier usage is similar to midivolume. In this final section on MIDI we want to demonstrate the use of the CindyScript MIDI in three small, but more advanced examples. The user is invited to take these examples as a starting point for further own experiments. In this example we want to program a piano that can be played by hitting the keys of the computer keyboard. To do so one has simply to put the following code into the timer tick event of the CindyScript code window, press the play button that appears in the Cinderella view and play. The code makes use of the CindyScript operator keydownlist(). This operator gives a list of all (computer-internal) keycodes of keys that are pressed at this moment. The list pairs associates the key codes to notes that have to be played. The forall loop checks for every possibly hit or released key and specifically turns on or of off the note that is associated to this key by using playtone and stoptone. On a contemporary computer this code is quite free of latency and can be used as a real instrument. Our next example is really very tiny and uses just one playtone(...) statement in the right place. We want to create a Ping-Pong game with sound effects. By using the physics simulation facilities of CindyLab it is very easy to construct a physically reasonable interactive Ping-Pong table. 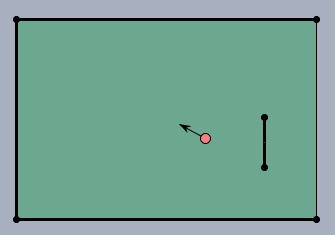 The boundary of the table is created by physical bouncers. In the Inspector each of these bouncers can be associated with a script that is executed at the moment when a mass hits the bouncer. 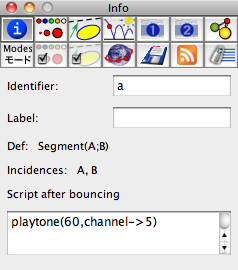 There we have to simply place a playtone statement that produces a "click" sound. That's it. Finally, our last example exemplifies the precision of the sequencer timing. it simply plays the beginning of the famous Charlie Parker Jazz tune Ornithology (Charlies nickname was Bird and this title refers to his nickname). A typical thing for Jazz is its groovy timing, the Swing feeling. This comes from a certain sensible shift of of the notes with respect to the ground beat. In the following example code the variable g is used as a "Swing parameter". It shifts the beginning of each second note with resect to the ground beat. It is instructive to associate g with a movable point in a range from 0.0 to 1.0. By this one can very easily adjust the amount of Swing feeling used by the tune (in a range between 0.5 and 0.7 it sounds quite reasonable). Page last modified on Monday 05 of September, 2011 [09:04:16 UTC] by Kortenkamp.